—13— This Program not only assures that you are receiving top quality products, but if vehicles are maintained per the Program's terms, you know that repairs are insured should a covered part fail during the lifetime of the vehicle. Program Provisions: 1. 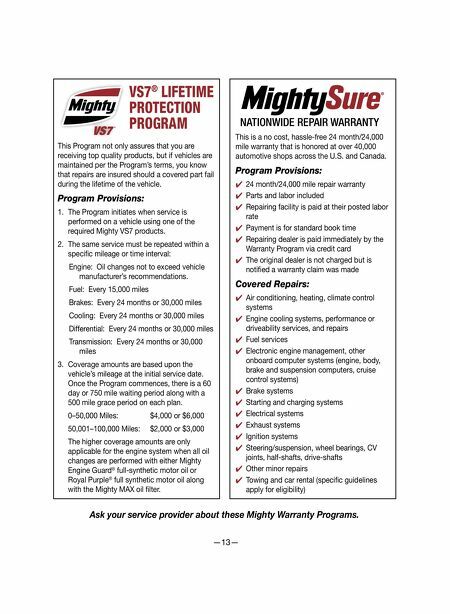 The Program initiates when service is performed on a vehicle using one of the required Mighty VS7 products. 2. The same service must be repeated within a specifi c mileage or time interval: Engine: Oil changes not to exceed vehicle manufacturer's recommendations. Fuel: Every 15,000 miles Brakes: Every 24 months or 30,000 miles Cooling: Every 24 months or 30,000 miles Differential: Every 24 months or 30,000 miles Transmission: Every 24 months or 30,000 miles 3. Coverage amounts are based upon the vehicle's mileage at the initial service date. Once the Program commences, there is a 60 day or 750 mile waiting period along with a 500 mile grace period on each plan. 0–50,000 Miles: $4,000 or $6,000 50,001–100,000 Miles: $2,000 or $3,000 The higher coverage amounts are only applicable for the engine system when all oil changes are performed with either Mighty Engine Guard ® full-synthetic motor oil or Royal Purple ® full synthetic motor oil along with the Mighty MAX oil fi lter. 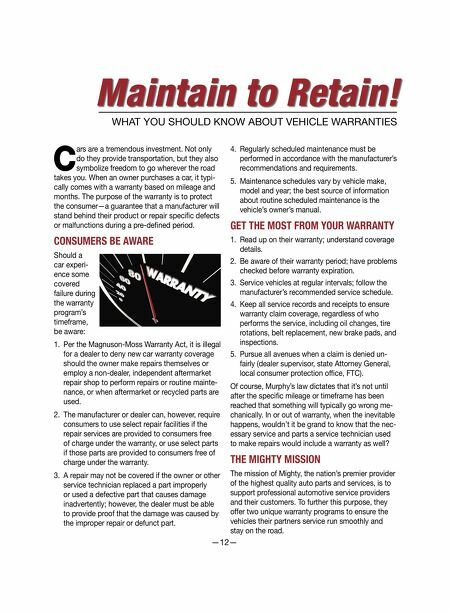 This is a no cost, hassle-free 24 month/24,000 mile warranty that is honored at over 40,000 automotive shops across the U.S. and Canada. Program Provisions: ✔ 24 month/24,000 mile repair warranty ✔ Parts and labor included ✔ Repairing facility is paid at their posted labor rate ✔ Payment is for standard book time ✔ Repairing dealer is paid immediately by the Warranty Program via credit card ✔ The original dealer is not charged but is notifi ed a warranty claim was made Covered Repairs: ✔ Air conditioning, heating, climate control systems ✔ Engine cooling systems, performance or driveability services, and repairs ✔ Fuel services ✔ Electronic engine management, other onboard computer systems (engine, body, brake and suspension computers, cruise control systems) ✔ Brake systems ✔ Starting and charging systems ✔ Electrical systems ✔ Exhaust systems ✔ Ignition systems ✔ Steering/suspension, wheel bearings, CV joints, half-shafts, drive-shafts ✔ Other minor repairs ✔ Towing and car rental (specifi c guidelines apply for eligibility) S ure ¨ NA TIONWIDE REPAIR WARRANTY VS7 ® LIFETIME PROTECTION PROGRAM Ask your service provider about these Mighty Warranty Programs.